You can delete quizzes from your course. Deleting a quiz will remove it completely from your course. If you would rather hide the quiz or make it inaccessible to submissions, you can lock the quiz or modify the access dates. If the quiz has no student submissions, you can unpublish the quiz. When Multiple Grading Periods are enabled in a course, you cannot delete individual quizzes for any student, group, or section in a closed grading period. 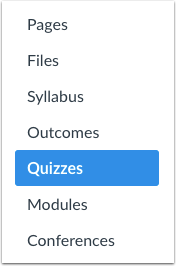 If you are editing the settings of an existing quiz, click the quiz title to open the quiz . If you want to delete the entire quiz, click the Options icon , then click Delete. You can also visit the quiz page, click the Options icon , and select the Delete link . A pop-up window will appear in your browser. 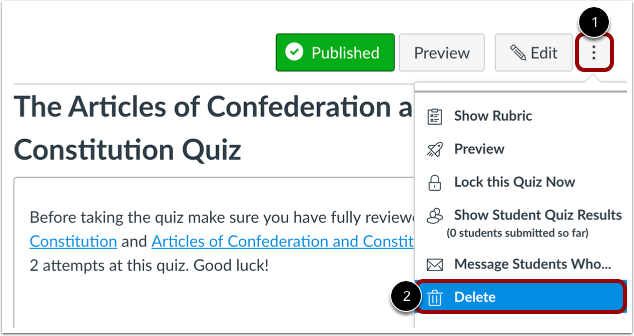 Click OK to delete the quiz or Cancel to edit your quiz in another manner. Note: Deleting a quiz will remove it completely from your course. If you would rather hide the quiz or make it inaccessible to submissions, you can lock the quiz or modify the access dates. If the quiz has no student submissions, you can unpublish the quiz. Previous Topic:How do I assign a quiz to a course section? Next Topic:How do I export quiz content from a course? Table of Contents > Quizzes > How do I delete a quiz? Re: Is a published quiz intended to be able to be unpublished after a person completes the quiz in Student View?